Courtney Luciana, a journalism student at Southern Connecticut State University, reported this story in 2017 as part of Journalism Capstone coursework on World War I.
Flanking Derby Avenue alongside Yale’s baseball and football facilities, a bronze plaque and flagpole commemorate the World War I service of the 102nd Infantry Regiment. The memorial is situated where the unit once camped during training. In August 1917, the Connecticut National Guard merged with the 1st Connecticut Regiment and became the 102nd Infantry Regiment, under the 26th “Yankee” Division. The Army divisions at that time included the Regular Army, with divisions 1-25; National Guard troops in divisions 26-75; and the drafted Army divisions of 76 and up. 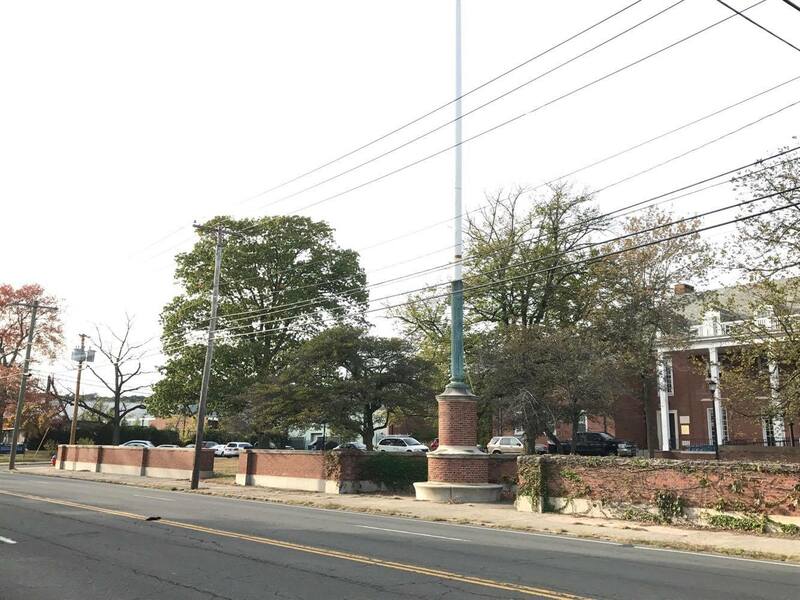 On the north side of Derby Avenue, which is Route 34, sits the 80-foot-flagpole, and on the south side, directly across, is the 51-inch by 33-inch bronze plaque mounted on a brick wall. The 102nd celebrated its 100th anniversary on Sept. 9, 2017, said Ed Kacey, curator of West Haven Veterans Museum & Learning Center. The 80-foot-tall flagpole on the North side of Derby Avenue. Courtney Luciana photo. 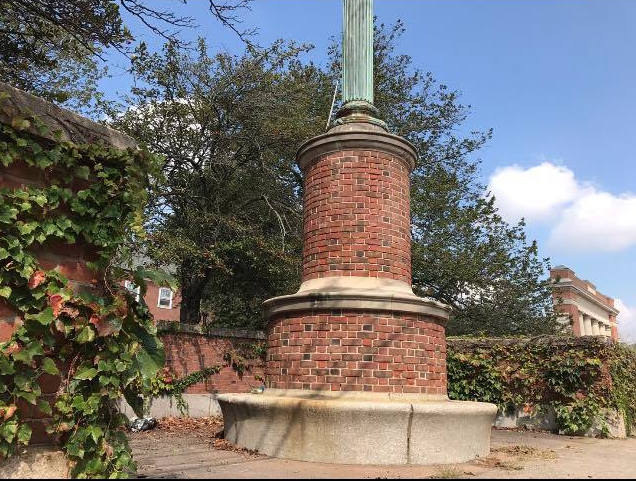 Yale gifted the monument to the regiment, according to a New Haven Register article from Nov. 5, 1942. More than 200 people attended the unveiling of the plaque, including Brig-Gen. John H. “Machine Gun” Parker, who was in command of the 102nd. According to the New Haven Register article, Capt. Philip H. English delivered the dedicatory address to the men and officers of the 102nd. Closer look of the flagpole across the street, from the bronze plaque. Courtney Luciana photo. Kacey calls “Connecticut Fights: The Story of the 102nd Regiment” the bible of the 102nd Regiment. Capt. Daniel Walter Strickland, the author, talks about the days that the unit camped out on the soccer fields right next to 279 Derby Ave. spending weeks in an exhausting drill and camp routine. From the autumn of 1917 until early 1918, the unit trained for the battle. According to NewHavenGrays.org, when the 102nd Infantry returned to Connecticut from battling in France they transformed into National Guard Units on Goffe Street in New Haven. Mark Arminio, former New Haven Gray from the 26th Division, said he studied the 102nd memorial and believes the two parts should be together.